In our household it isn’t uncommon to plan a week’s worth of meals around a big juicy bird or a large cut of meat. This past weekend as the weather started curling from hot to balmy, the comfort food chord struck home in our bellies and had us hankering to welcome in the fall. This meant Sunday evening was spent with a slow roasted turkey and pile of whipped potato and butternut squash; Monday night savoring a homey turkey, carrot, Chinese sausage and onion version of the Asian slow-cooked rice porridge jook; Tuesday night linguine with shredded turkey meat; and last night going on a Southern style bender complete with turkey and gravy, a decadent fried egg, crispy turkey skin cracklins, butternut cubes and the best part, homemade fluffy biscuits. Although I haven’t had one in years, I’ve always loved biscuits—especially the way their harder exteriors melt into whatever gooey, gravy, sweet, saucy, tangy substances are placed upon them to soak, rendering their soft innards and outer crust into one big buttery sense of ooh. I was that strange kid who would cut a steaming biscuit in half and make a sandwich out of the entire contents of my plate no matter what I was eating: turkey, cranberry, mashed potatoes during the holidays or chicken, corn, peas, and cream sauce during an ordinary family dinner. Biscuits to me were always the perfect vehicle for an entire meal. Luckily, the Cute Gardener is a dynamite baker so I was notably spoiled by a homemade version of my long lost biscuit friend. Both the CG and I are huge fans of the magazine Cook’s Illustrated because it is all about precision cooking. Nothing gets printed between its pages unless their staff of chefs have not only tried to make it in their own kitchen, but have also done everything possible to tweak and perfect each element of every dish to produce a supreme recipe. So, unlike the times when I trawl the web and fall for ideas of food to make from prettily illustrated food bloggers or the like, I know with Cook’s I am guaranteed a good result. I’ve actually stopped using recipes from anywhere other than a few trusted resources these days like Food & Wine or a few close foodie buddies or my tried and true Around Dorie’s French Table book at home. The biscuit recipe used in this meal came from the CG’s book The Best Recipe written by the editors of Cook’s. A fluffy, soft and creamy biscuit was born and lasted me through dinner and then onto my ensuing dessert and breakfast plates heated in the toaster oven before smothered in butter, blackberry preserves and honey. If you are using yogurt instead of buttermilk in this recipe, note that 8 ounces of yogurt equals 1 cup plus 2 tablespoons, not 1 cup as you might expect. Make sure that your over rack is set at the center position. Baked too low, your biscuits will likely end up with burnt bottoms. 1. Adjust oven rack to middle position and heat the oven to 450 degrees. 2. Mix or pulse flours, baking powder, baking soda, sugar, and salt in a large bowl or the work bowl of a food processor fitted with steel blade. With your fingertips, a pastry blender, 2 knives, or steel blade of the food processor, mix, cut, or process butter into the dry ingredients until the mixture resembles coarse meal with a few slightly larger butter lumps. 3. If making by hand, stir in buttermilk with a rubber spatula or fork until mixture forms into soft, slightly sticky ball. If dough feels firm and dry bits are not gathering into a ball, sprinkle dough clumps with additional tablespoon of buttermilk (or milk for the yogurt dough). Be careful not to overmix. If using food processor, pulse until dough gathers into moist clumps. Remove from food processor bowl and form into rough ball. 4. With lightly floured hands, divide dough into 12 equal portions. Lightly pat a portion of dough back and forth a few times between floured hands until it begins to form a ball, then pat lightly with cupped hands to form a rough ball. Repeat with remaining dough, placing formed dough rounds 1 inch apart on ungreased cookie sheet. Brush dough tops with melted butter (May be covered with plastic wrap and refrigerated for up to two hours.) Bake until biscuit tops are light brown, 10-12 minutes. Serve immediately. This entry was posted in Through The Stomach and tagged Around My French Table, Cute Gardener, Dorie Greenspan, food and wine, homemade biscuit recipes, Kimberly Nichols, the best recipe book by cook's illustrated, through the stomach, Unorthodox Foodie by unorthodoxfoodie. Bookmark the permalink. Great post! Having been raised in the South, I am very fond of biscuits and can make a meal of them with jam, or smothered in gravy! Also love Cook’s Illustrated, though I am usually too lazy to follow their instructions to the letter. Thanks for reading, glad you enjoyed the post! 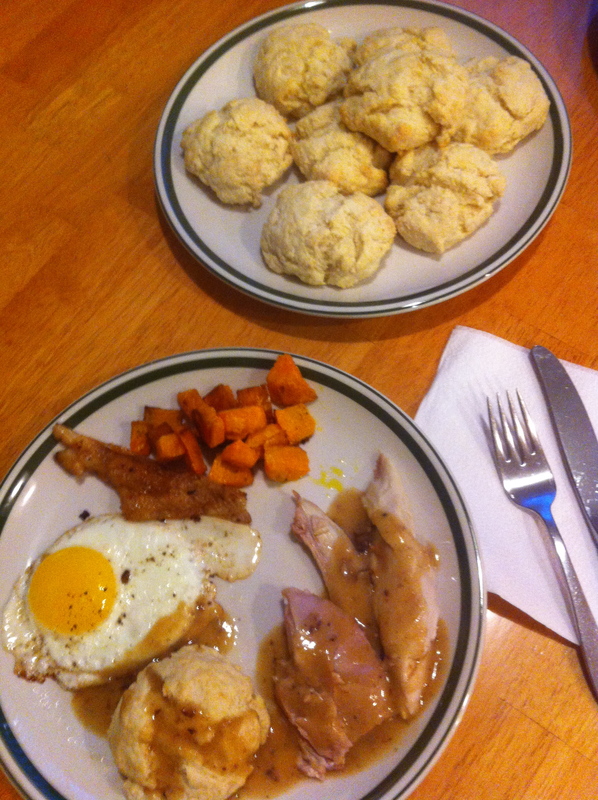 I’ve a weak spot for biscuits, biscuits and gravy and biscuit sandwiches. These sound right up my alley! Cooks Illustrates is a great source, and I agree they have tested their recipes so much that you most always end up with success.